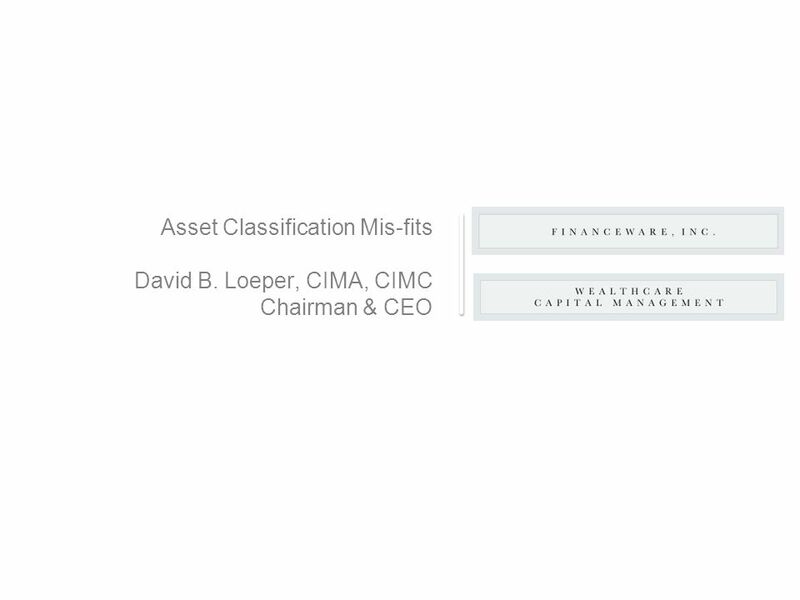 Asset Classification Mis-fits David B. Loeper, CIMA, CIMC Chairman & CEO. 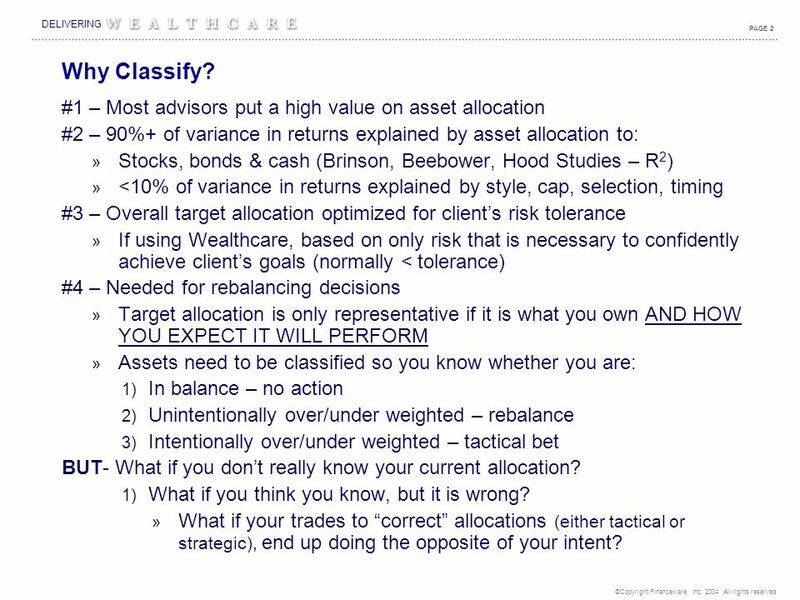 3 ©Copyright Financeware, Inc. 2004 All rights reserved DELIVERING PAGE 2 #1 – Most advisors put a high value on asset allocation #2 – 90%+ of variance in returns explained by asset allocation to: » Stocks, bonds & cash (Brinson, Beebower, Hood Studies – R 2 ) » <10% of variance in returns explained by style, cap, selection, timing #3 – Overall target allocation optimized for client’s risk tolerance » If using Wealthcare, based on only risk that is necessary to confidently achieve client’s goals (normally < tolerance) #4 – Needed for rebalancing decisions » Target allocation is only representative if it is what you own AND HOW YOU EXPECT IT WILL PERFORM » Assets need to be classified so you know whether you are: 1) In balance – no action 2) Unintentionally over/under weighted – rebalance 3) Intentionally over/under weighted – tactical bet BUT- What if you don’t really know your current allocation? 1) What if you think you know, but it is wrong? 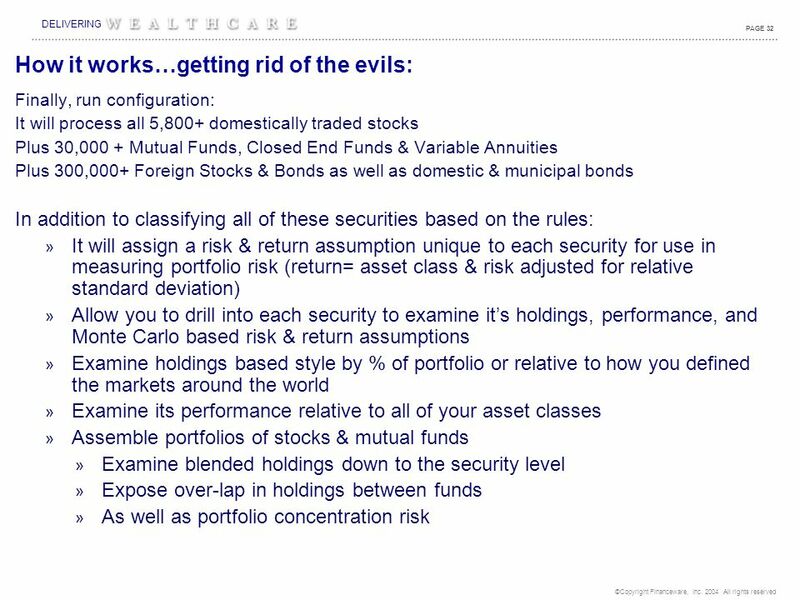 » What if your trades to “correct” allocations (either tactical or strategic), end up doing the opposite of your intent? Why Classify? 10 ©Copyright Financeware, Inc. 2004 All rights reserved DELIVERING PAGE 9 What’s Growth & Value? 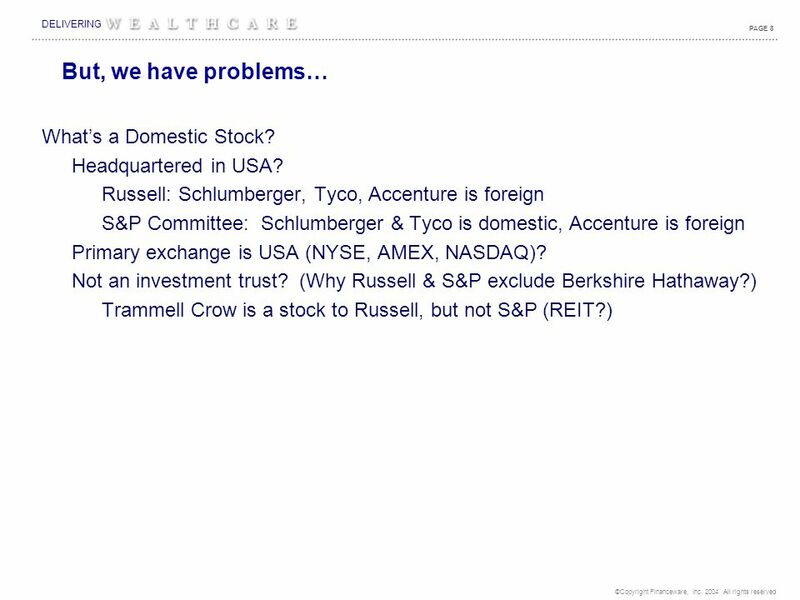 In Russell 3000 Growth or Value? About 30% of the stocks are in both P/B if known, adjusted for forecasts, maybe P/S Otherwise, assume average Above median (or below) price to book? 2/3 of the market cap is growth (Fama: the market over-weights growth?!) Above median (or below) price to book market cap adjusted? 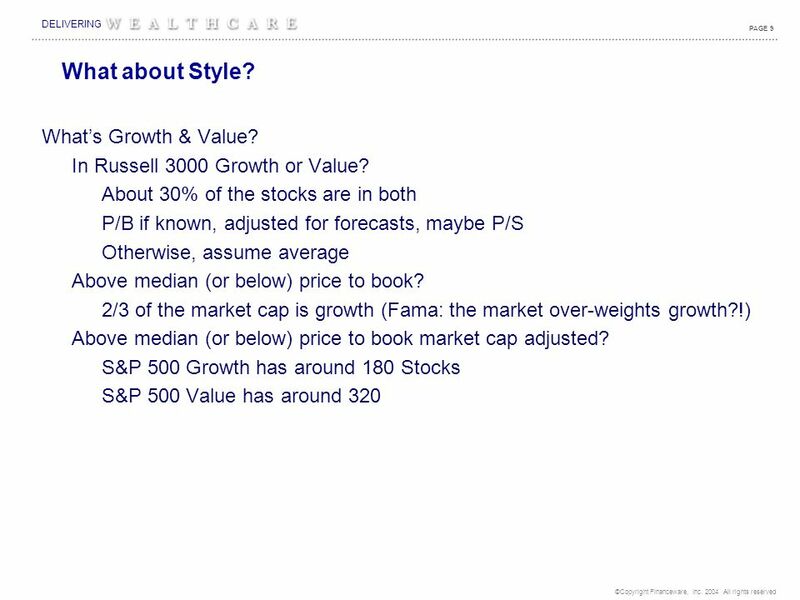 S&P 500 Growth has around 180 Stocks S&P 500 Value has around 320 What about Style? 11 ©Copyright Financeware, Inc. 2004 All rights reserved DELIVERING PAGE 10 Russell - Annually Enron, K-Mart, Worldcom = Large Cap Bankrupt for up to a year S&P – Semi- Annually Only for 6 months, unless the committee decides to keep the stock anyway… MCI - $4B+ Market Cap – Excluded from both at the moment How often do we evaluate? 12 ©Copyright Financeware, Inc. 2004 All rights reserved DELIVERING PAGE 11 For any one stock, depending on who you ask… » It could be large cap, mid cap, or small cap » Domestic, foreign or not even a stock at all! 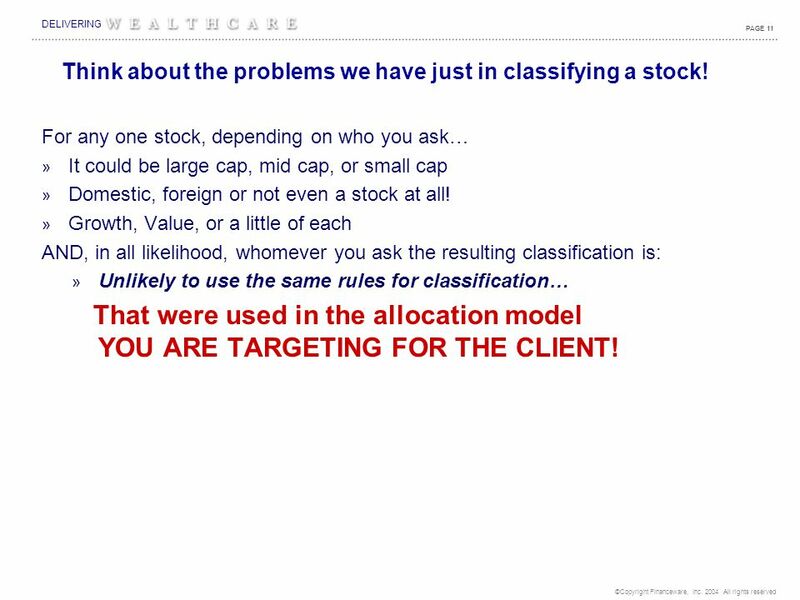 » Growth, Value, or a little of each AND, in all likelihood, whomever you ask the resulting classification is: » Unlikely to use the same rules for classification… That were used in the allocation model YOU ARE TARGETING FOR THE CLIENT! 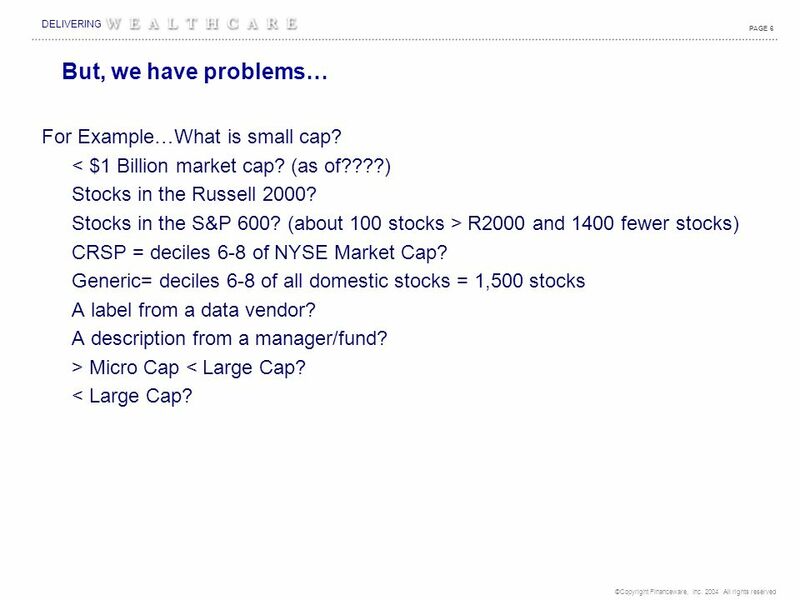 Think about the problems we have just in classifying a stock! 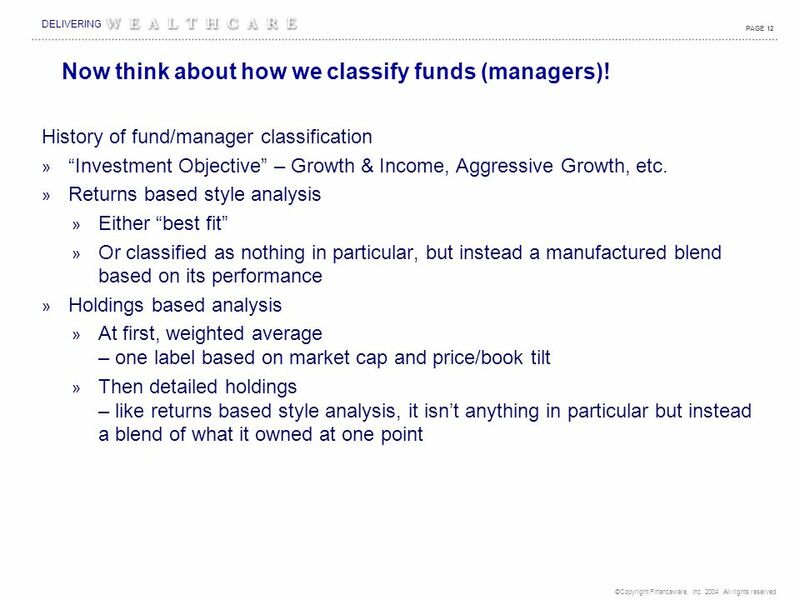 13 ©Copyright Financeware, Inc. 2004 All rights reserved DELIVERING PAGE 12 History of fund/manager classification » “Investment Objective” – Growth & Income, Aggressive Growth, etc. » Returns based style analysis » Either “best fit” » Or classified as nothing in particular, but instead a manufactured blend based on its performance » Holdings based analysis » At first, weighted average – one label based on market cap and price/book tilt » Then detailed holdings – like returns based style analysis, it isn’t anything in particular but instead a blend of what it owned at one point Now think about how we classify funds (managers)! 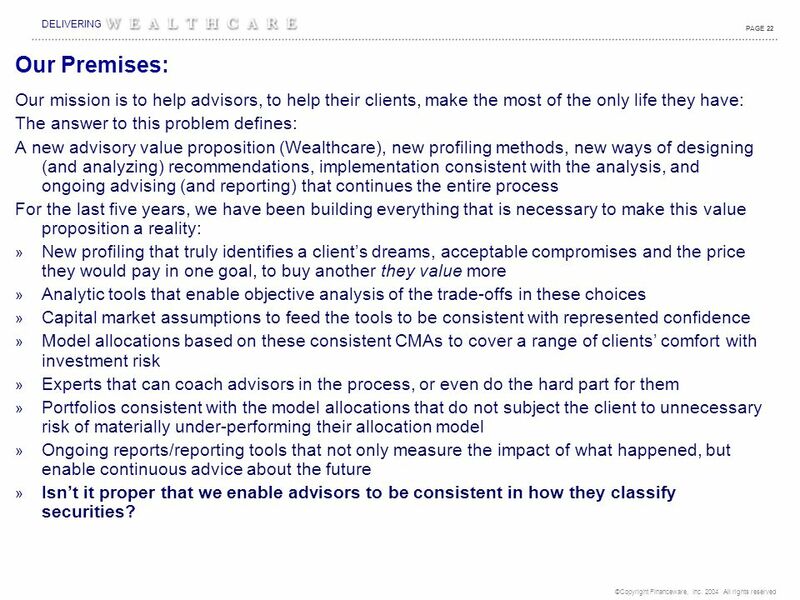 14 ©Copyright Financeware, Inc. 2004 All rights reserved DELIVERING PAGE 13 History of fund/manager classification » “Investment Objective” – Growth & Income, Aggressive Growth, etc. 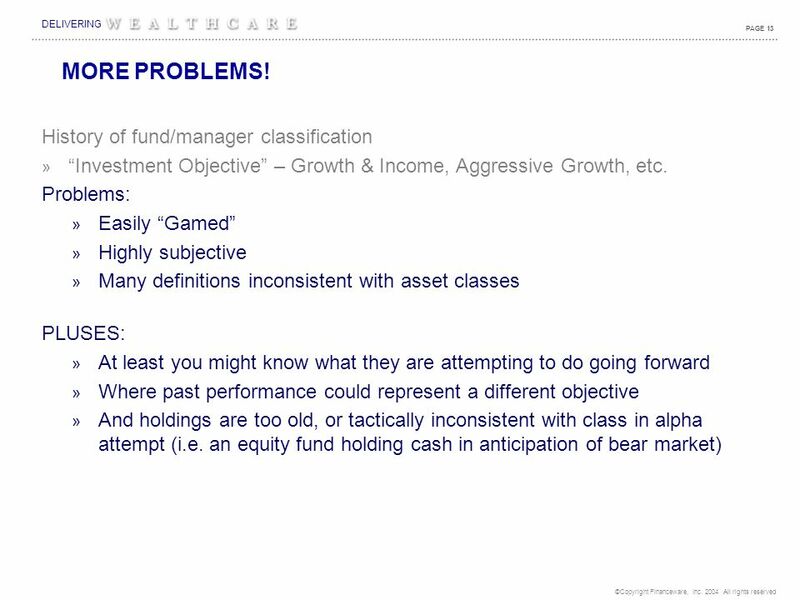 Problems: » Easily “Gamed” » Highly subjective » Many definitions inconsistent with asset classes PLUSES: » At least you might know what they are attempting to do going forward » Where past performance could represent a different objective » And holdings are too old, or tactically inconsistent with class in alpha attempt (i.e. an equity fund holding cash in anticipation of bear market) MORE PROBLEMS! 15 ©Copyright Financeware, Inc. 2004 All rights reserved DELIVERING PAGE 14 History of fund/manager classification » Returns based style analysis » Either “best fit” » Or classified as nothing in particular, but instead a manufactured blend based on its performance Problems: » Dependent completely on past performance being representative of future performance (isn’t there a rule about this somewhere?) 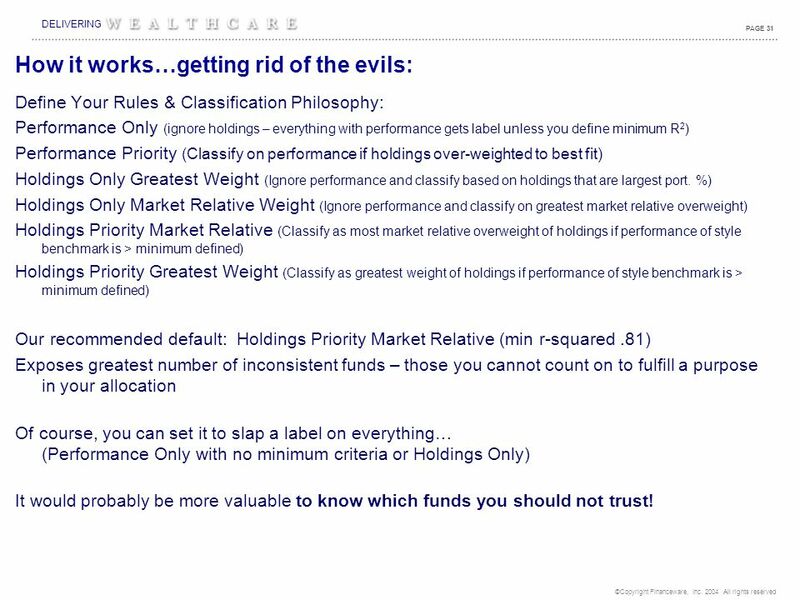 » Wacky statistical results (equity fund with statistical bond allocation due to overweighting to interest sensitive stocks) Pluses: » Can label anything with performance if you don’t mind nearly every fund isn’t classified as anything in particular (is the label what’s important?) 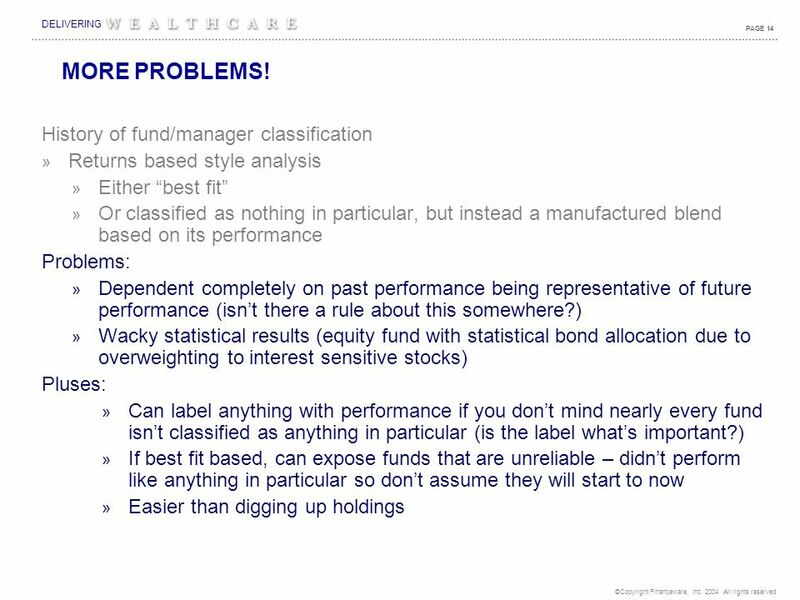 » If best fit based, can expose funds that are unreliable – didn’t perform like anything in particular so don’t assume they will start to now » Easier than digging up holdings MORE PROBLEMS! 16 ©Copyright Financeware, Inc. 2004 All rights reserved DELIVERING PAGE 15 History of fund/manager classification » Holdings based analysis » At first, weighted average – one label based on market cap and price/book tilt » Then detailed holdings – like returns based style analysis, it isn’t anything in particular but instead a blend of what it owned at one point PROBLEMS » Holdings out of date (rebalance because of fund weighting- even though manager of fund already did?! 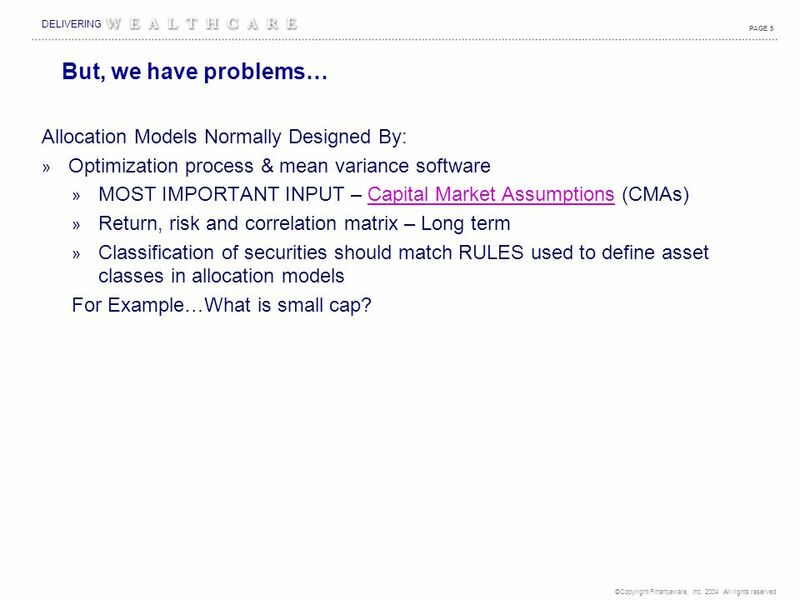 Result: overweight) » Vendor has different classification rules than allocation models (i.e. 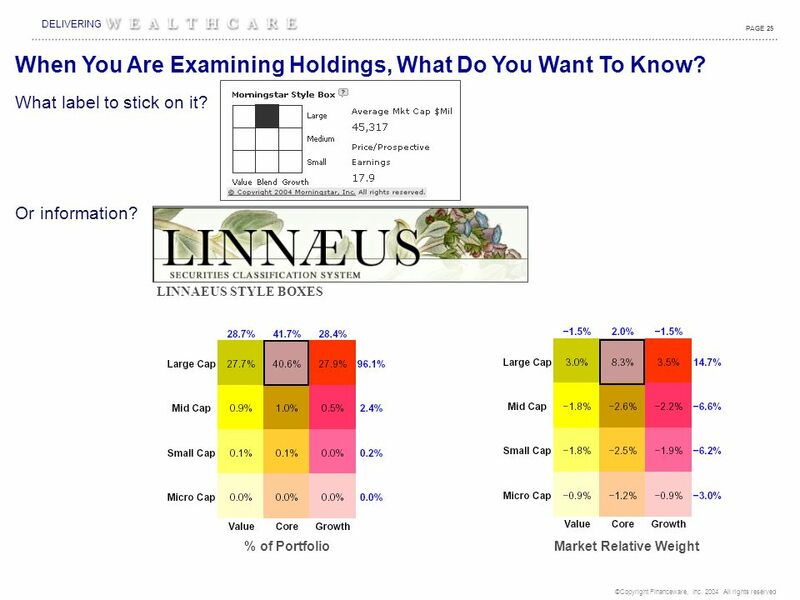 are the underlying stocks classified the same way?…i.e., all the problems we outlined in classifying stocks.) 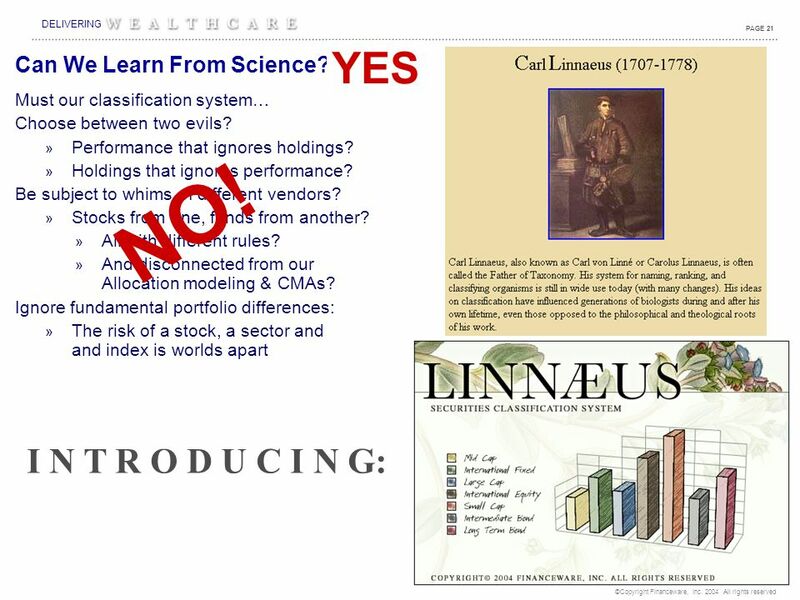 » Ignores performance – Which is worse? 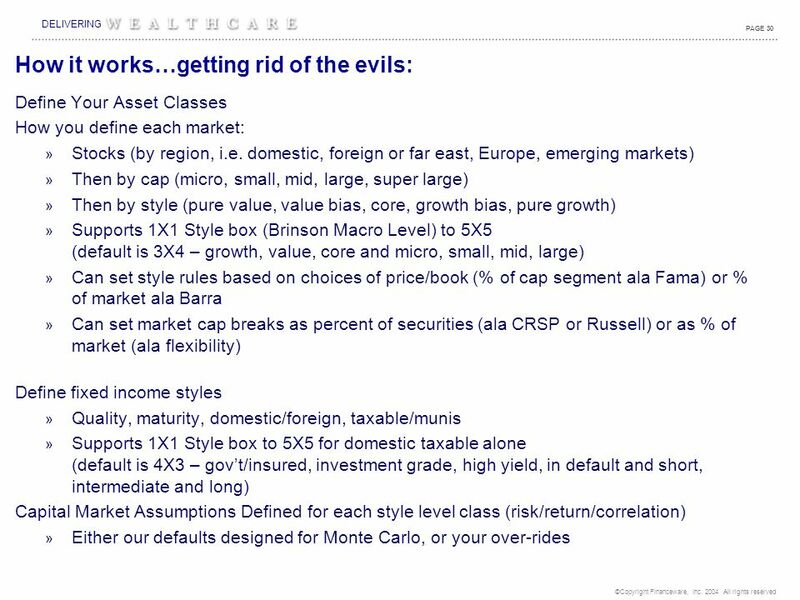 Returns based style that assumes performance will replicate, or holdings based that assume performance will match even though it never did! 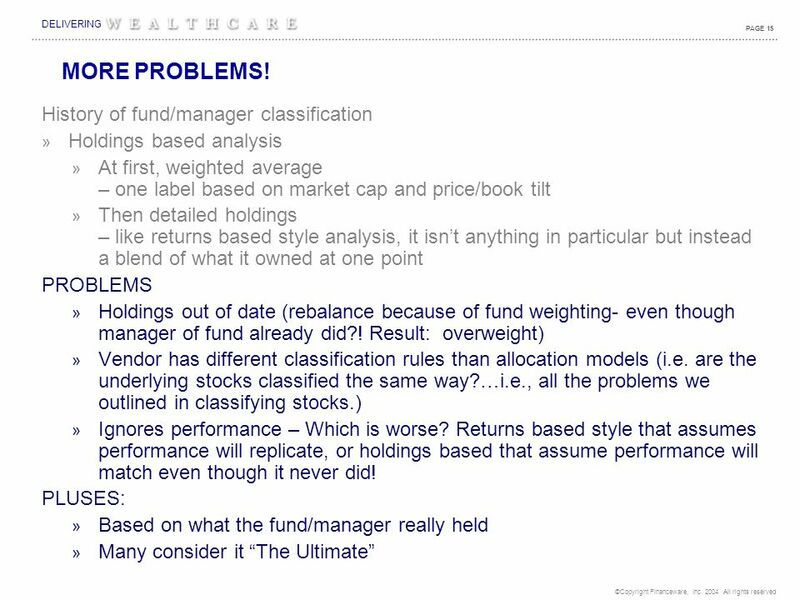 PLUSES: » Based on what the fund/manager really held » Many consider it “The Ultimate” MORE PROBLEMS! 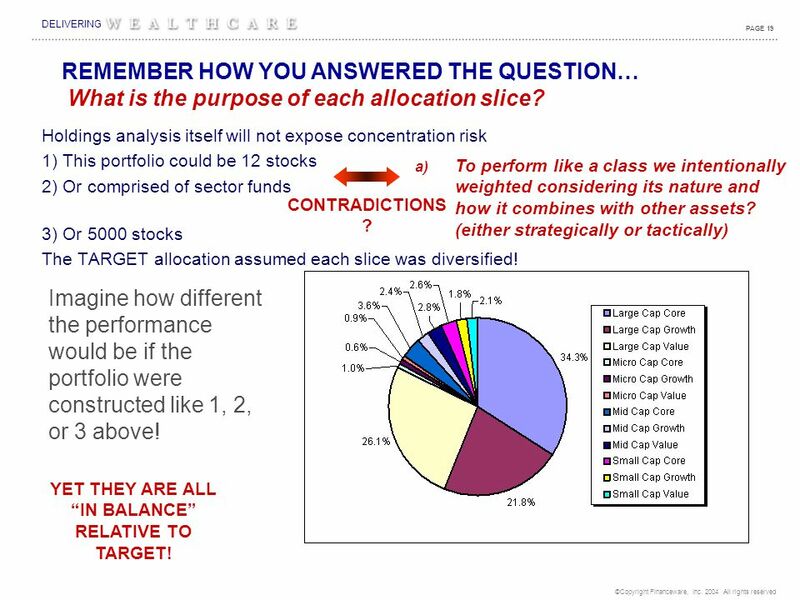 20 ©Copyright Financeware, Inc. 2004 All rights reserved DELIVERING PAGE 19 Holdings analysis itself will not expose concentration risk 1) This portfolio could be 12 stocks 2) Or comprised of sector funds 3) Or 5000 stocks The TARGET allocation assumed each slice was diversified! 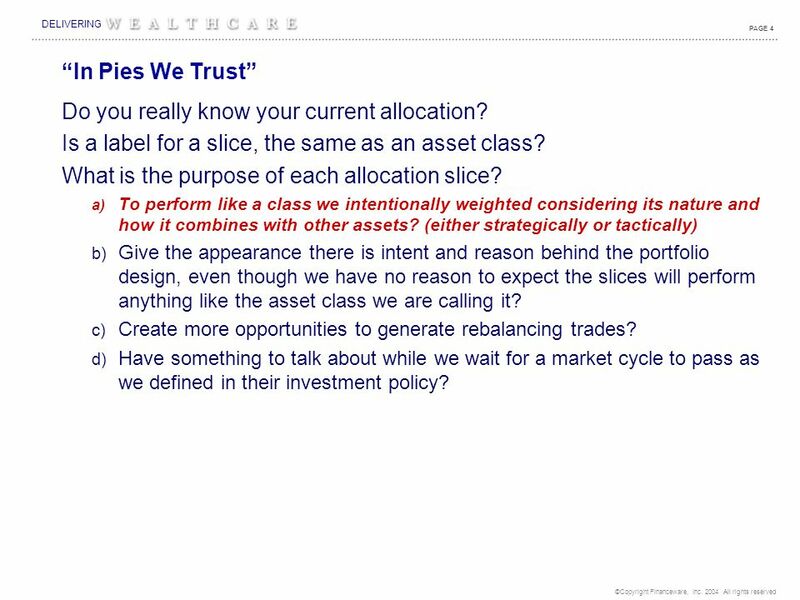 REMEMBER HOW YOU ANSWERED THE QUESTION… What is the purpose of each allocation slice? 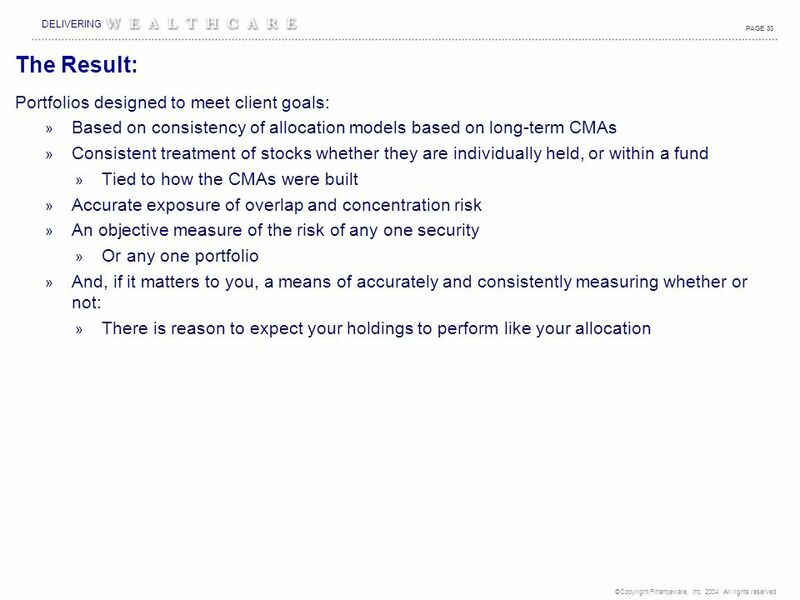 Imagine how different the performance would be if the portfolio were constructed like 1, 2, or 3 above! 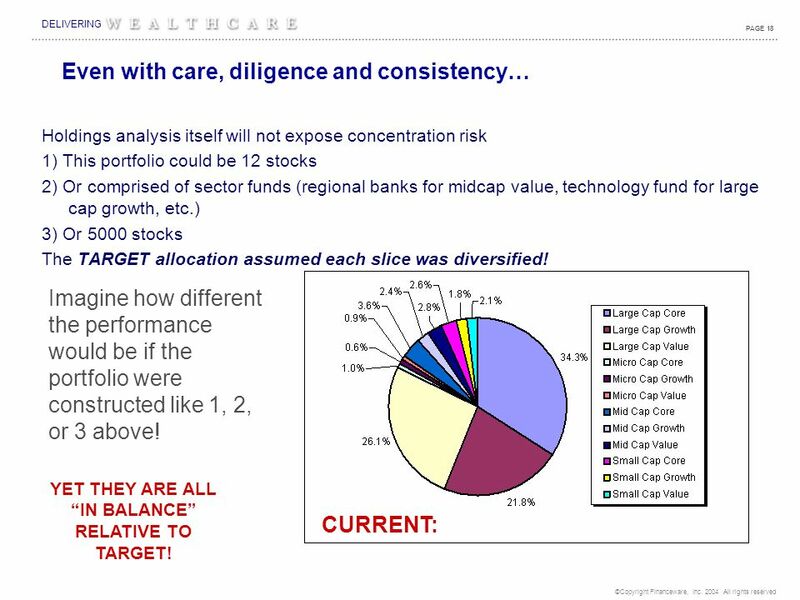 YET THEY ARE ALL “IN BALANCE” RELATIVE TO TARGET! a) To perform like a class we intentionally weighted considering its nature and how it combines with other assets? (either strategically or tactically) CONTRADICTIONS ? 24 ©Copyright Financeware, Inc. 2004 All rights reserved DELIVERING PAGE 23 Good point…we chose some easy examples…maybe they were outliers? Let’s Examine the data: Out of 14,463 Mutual Funds with performance & holdings data: » 1,363 or 9.6% had an R 2 of LESS THAN.64 TO ANY INDEX » 1,959 or 13.5% had an R 2 of LESS THAN.74 TO ANY INDEX » 2,619 or 18.1% had an R 2 of LESS THAN.80 TO ANY INDEX Which indices? » 60% S&P/40% LB Aggregate, LB Aggregate Bond, LB Interm Gov’t, LB Munis, LB Munis 10-Yr, LB High Yield Composite Bond Index, EAFE, NAREIT, Russell 1000, Russell 1000 Growth, Russell 1000 Value, Russell 2000, Russell 2000 Growth, Russell 2000 Value, Russell Midcap Growth Index, Russell Midcap Index, Russell Midcap Value Index, SBr Non-US World Govt Bonds, Tax-Free Money Market, 3 Month T-Bill Yield Don’t think this is a big deal? 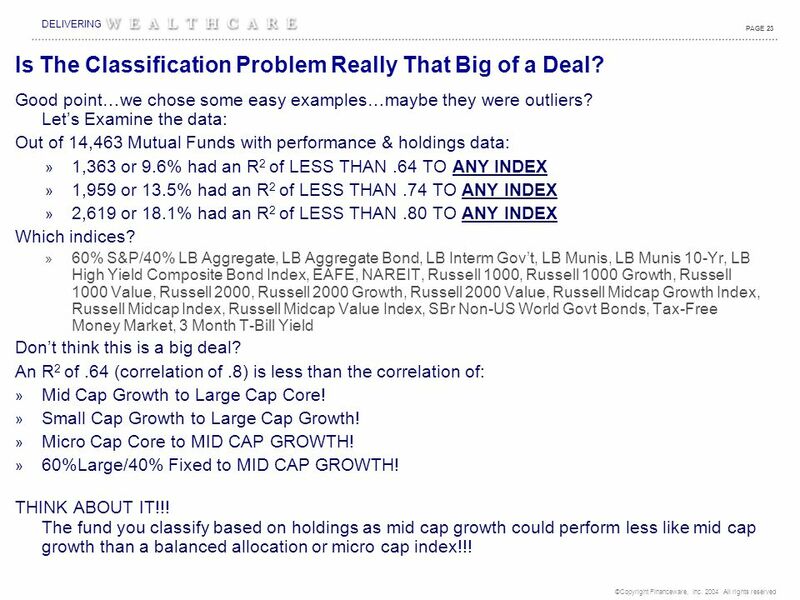 An R 2 of.64 (correlation of.8) is less than the correlation of: » Mid Cap Growth to Large Cap Core! 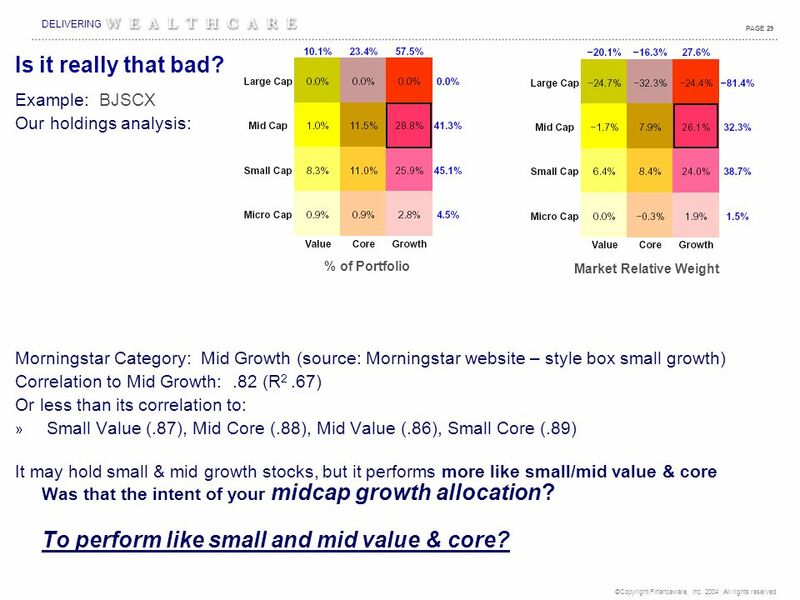 » Small Cap Growth to Large Cap Growth! » Micro Cap Core to MID CAP GROWTH! » 60%Large/40% Fixed to MID CAP GROWTH! THINK ABOUT IT!!! 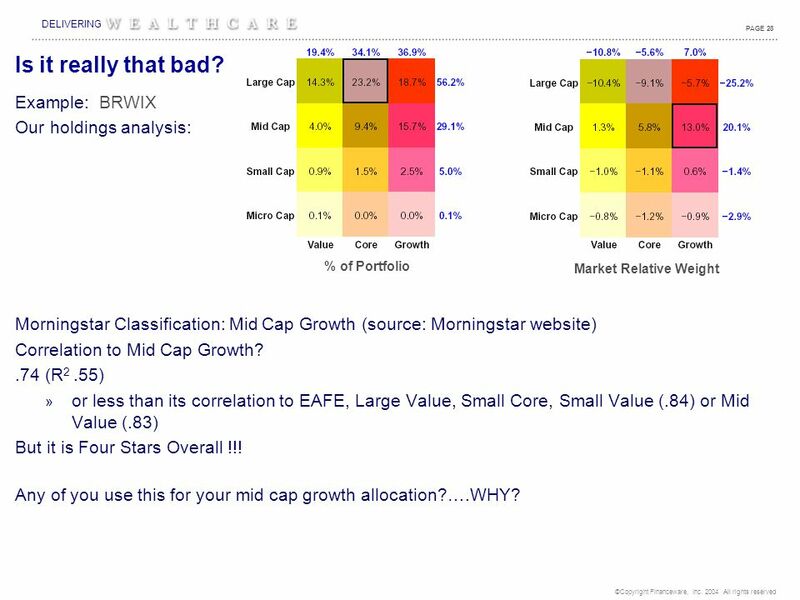 The fund you classify based on holdings as mid cap growth could perform less like mid cap growth than a balanced allocation or micro cap index!!! Is The Classification Problem Really That Big of a Deal? 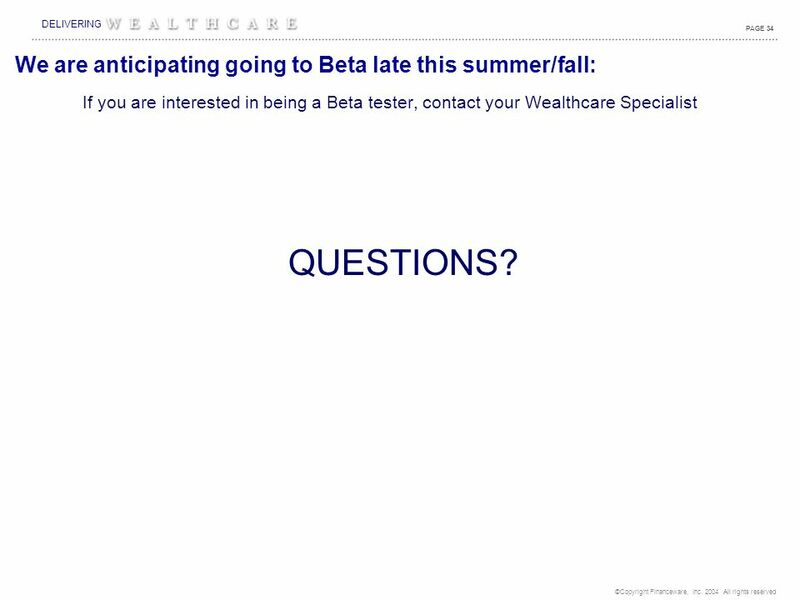 25 ©Copyright Financeware, Inc. 2004 All rights reserved DELIVERING PAGE 24 What if we just examine funds we have performance & holdings data on that: » Had a correlation to an equity style index of >.80 (R 2 >.64) » Had 90% or more of holdings in large, mid, small, growth, value, core Total number of funds that met both criteria: » 4,336 » Total funds whose performance best fit WAS DIFFERENT than, their greatest holdings overweight (market relative)? Want to take a guess? 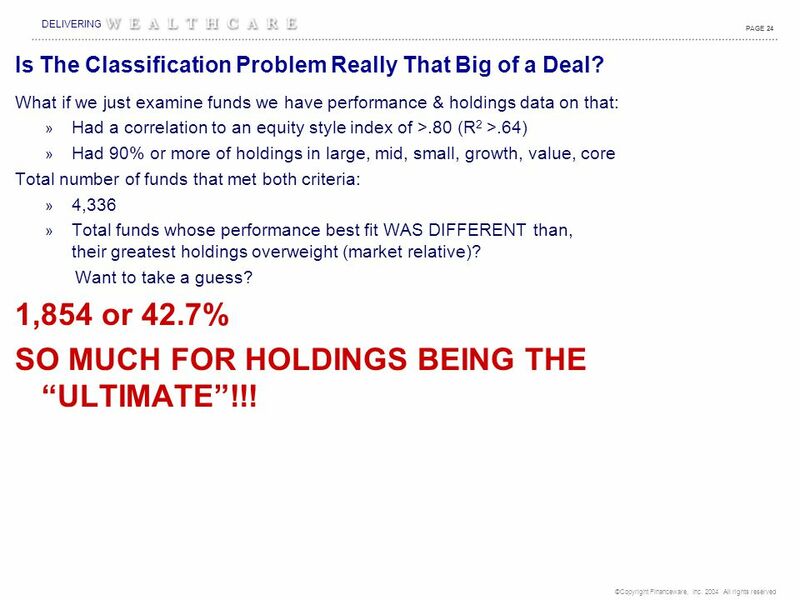 1,854 or 42.7% SO MUCH FOR HOLDINGS BEING THE “ULTIMATE”!!! Is The Classification Problem Really That Big of a Deal? 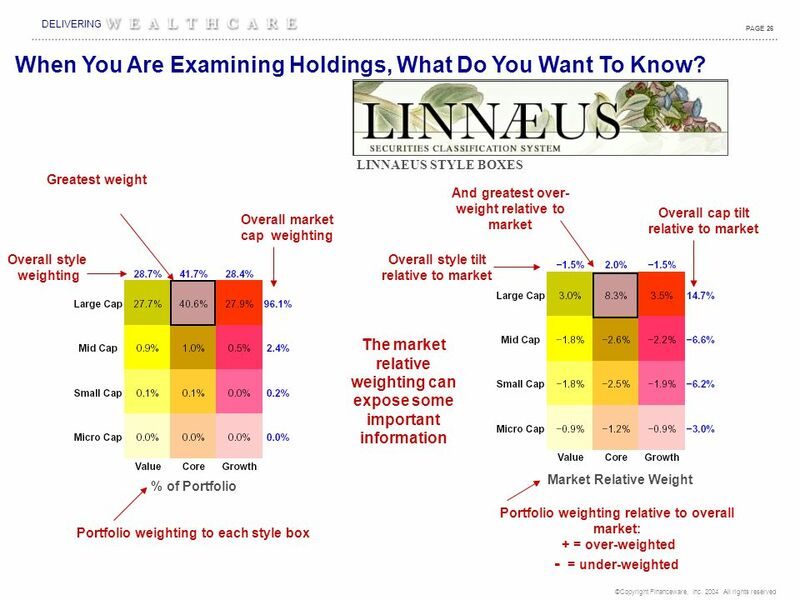 28 ©Copyright Financeware, Inc. 2004 All rights reserved DELIVERING PAGE 27 Compare These Two Large Cap Core Funds: LINNAEUS STYLE BOXES Market Relative Weight About the same, but this one must buy bigger large cap stocks…Right? 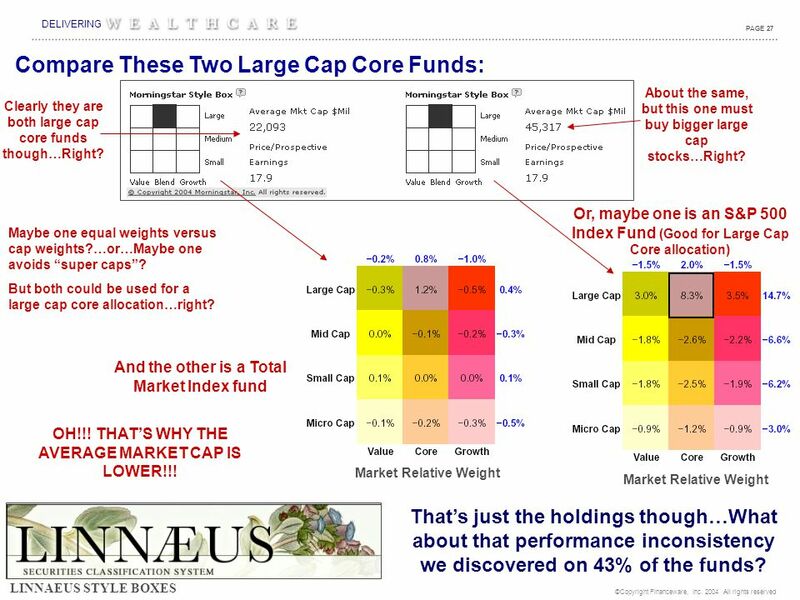 Or, maybe one is an S&P 500 Index Fund (Good for Large Cap Core allocation) Clearly they are both large cap core funds though…Right? Maybe one equal weights versus cap weights?…or…Maybe one avoids “super caps”? 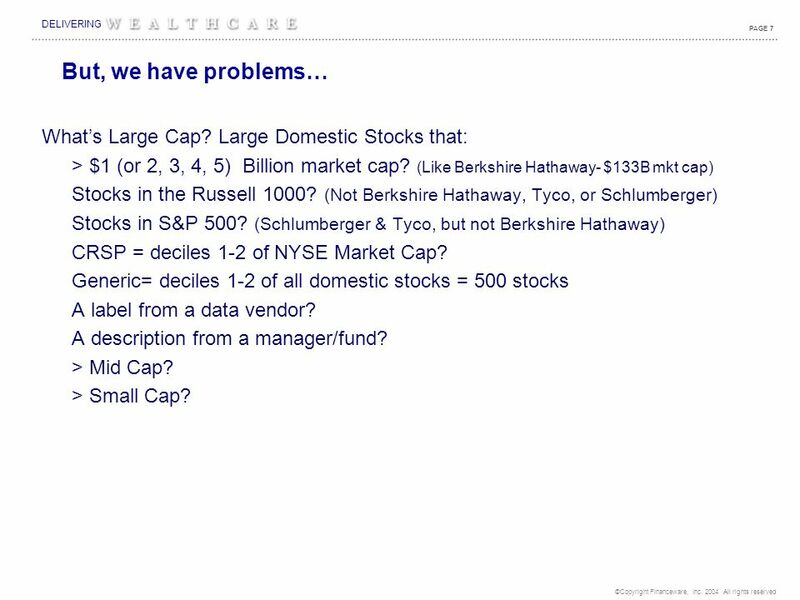 But both could be used for a large cap core allocation…right? 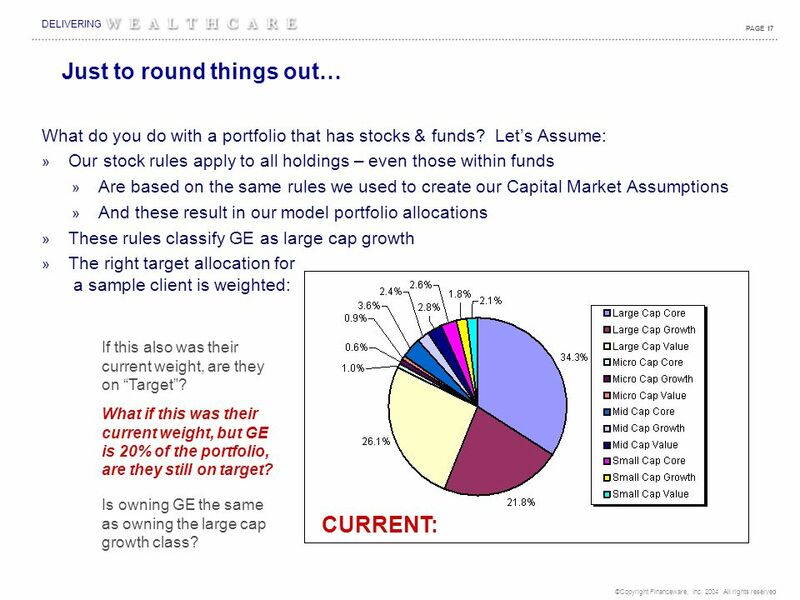 Market Relative Weight And the other is a Total Market Index fund OH!!! 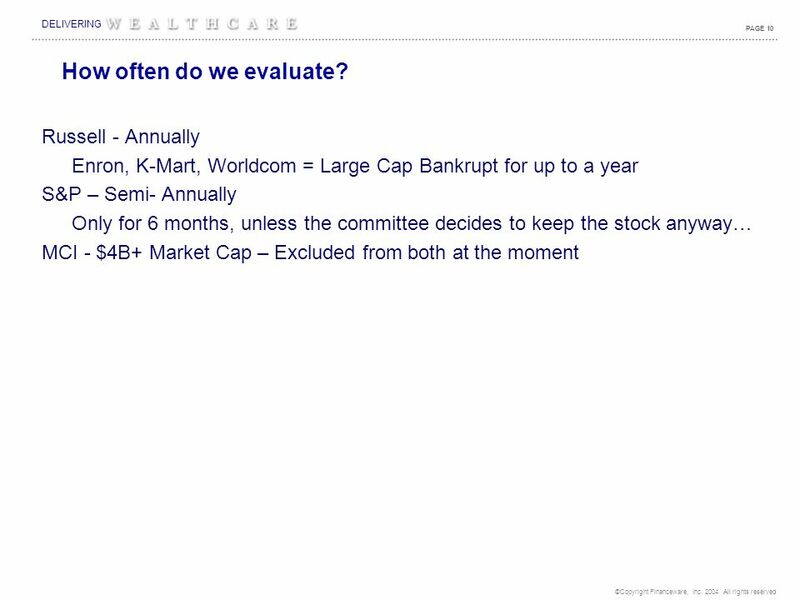 THAT’S WHY THE AVERAGE MARKET CAP IS LOWER!!! 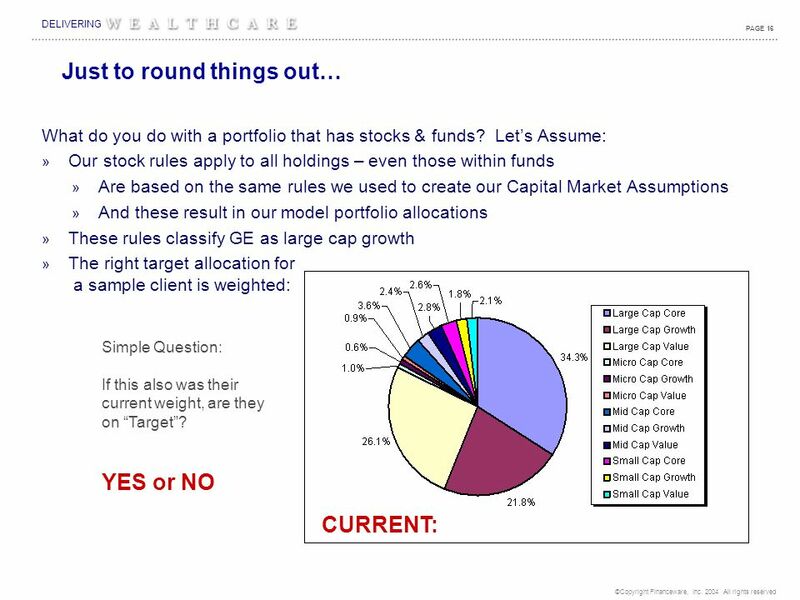 That’s just the holdings though…What about that performance inconsistency we discovered on 43% of the funds? 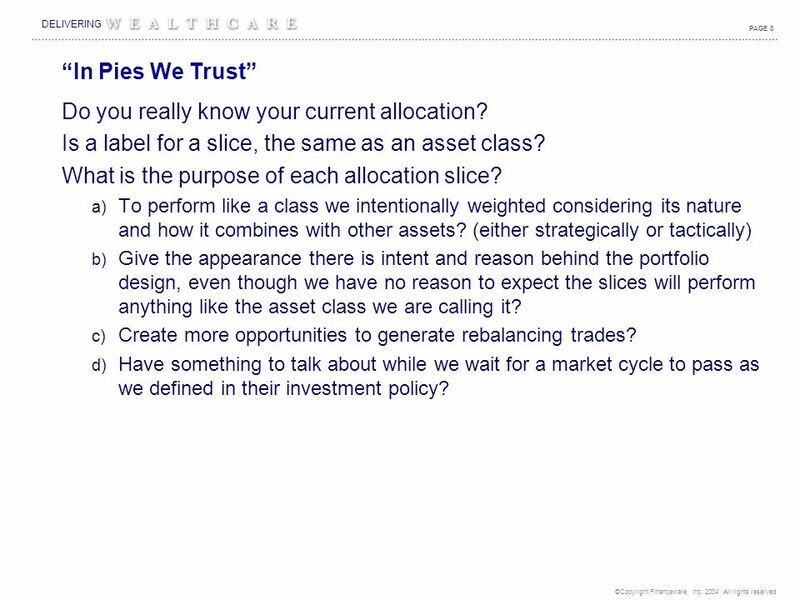 Download ppt "Asset Classification Mis-fits David B. Loeper, CIMA, CIMC Chairman & CEO." BetterInvestings Portfolio Manager Portfolio Manager with other BetterInvesting Resources Created by: QUANT IX SOFTWARE, Inc. Revised: November, 2005. New England Pension Consultants. 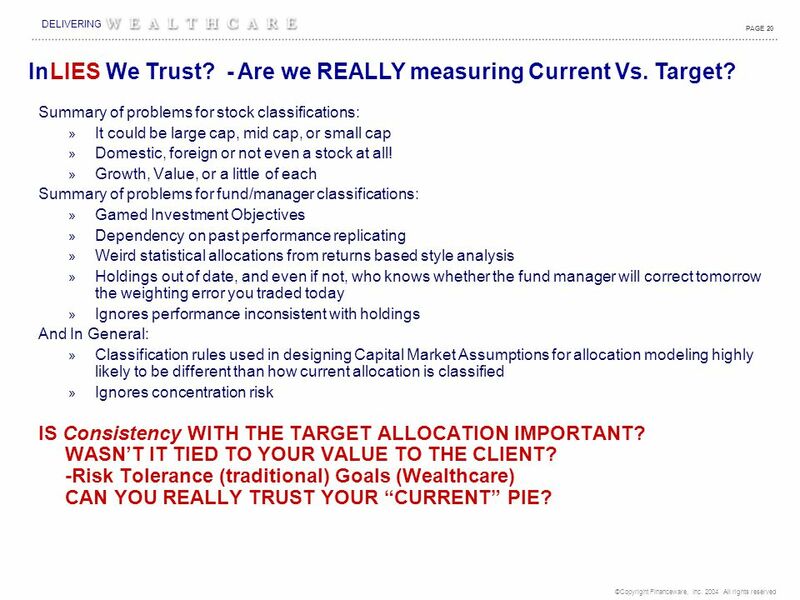 1 Table of Contents > Market Environment > Asset Allocation / Investment Policy Targets > Performance Summary > Performance. One Main Street, Cambridge, Massachusetts (617) ; F: (617) Fourth Quarter 2006 Investment Performance Analysis.